Our website and quick order app put you in control of your heating oil purchases. You can order anywhere and at anytime. Just enter your zip to see your super-low price and get started. Heatable is committed to providing consistently low heating oil prices. Our technology and streamlined process allow us to offer the same low price to everyone – no negotiating necessary. Founded by industry veterans, we’ve been around the block (literally hundreds of thousands of times). We're based in Kittery, Maine, have our own bright orange trucks, and make our own deliveries. Order oil anywhere, anytime. You'll love our app. 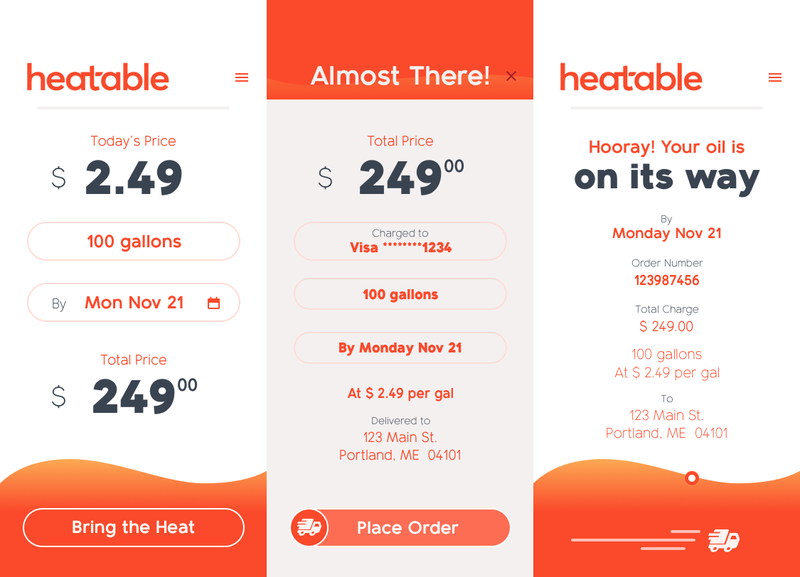 The heatable app allows you to order heating oil on the go. With just a couple of taps, your low cost heating oil is on the way. Hooray! Enter your ZIP code to find your heating oil price in just 1 click. Tell us how many gallons of heating oil you want to order and which credit card you’ll use to pay for it. We’ll deliver your heating oil as promised. We’ll even text you to confirm delivery. If your heating oil burning furnace won't start, try these simple troubleshooting tips.